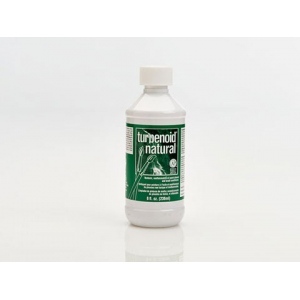 * Turpenoid Natural is an extremely effective nontoxic brush cleaner and gentle brush conditioner which rinses out with plain water. * Brushes are reconditioned when cleaned with Turpenoid Natural. * It is non-flammable, does not irritate skin or eyes and does not emit harmful vapors. * It is an effective painting medium when used within recommended guidelines. * Now, artists seeking safer choices, as well as students, seniors and those unable to enjoy the pleasures of oil painting because of problems with traditional solvents, have a new safe alternative. * Not recommended with Damar Varnish or crystals. * Use in paint mediums should not exceed 25% to ensure proper drying time. 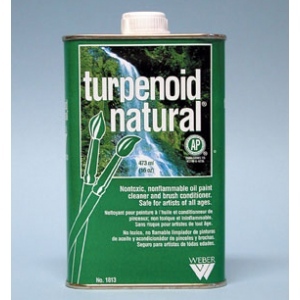 * Do not use Turpenoid Natural to create washes, glazes or to wet canvas before painting.